Accra, April 8, GNA- The National Secretariat of the Ghana Private Road Transport Union's (GPRTU) of the Trades Union Congress (TUC) on Thursday advised all motorists to exercise the greatest caution when driving to avoid accidents during the Easter celebrations. This was contained in a statement issued and signed by Mr Fred Nana Yaw Manu of the GPRTU National Secretariat. 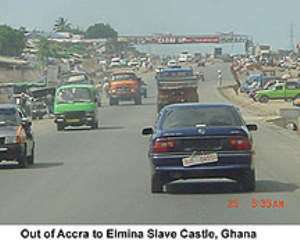 The statement said traditionally on festive occasions, when there is hustle and bustle on the part of drivers and the travelling public, there was always the temptation by drivers to indulge in overloading and sometimes uncalculated over-takings which always ended in painful and disastrous consequences. It said though many accident were unavoidable, if conscious effort were made by those behind the steering wheels and pedestrians, accidents could be reduced to the minimum. "GPRTU wishes all motorists to remember that accidents are not God made or pre-destined", the statement said. The statement urged all drivers and road users to exercise the greatest restraint, "always thinking of the passengers and the young ones at home" GPRTU wishes all drivers and customers an accident-free Easter, the statement said.